A growing number of investors are looking for high quality information on a company’s sustainability performance. 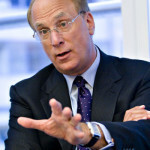 Earlier this year Larry Fink, CEO of Blackrock, called on S&P 500 CEOs to demonstrate how environmental, social and governance (ESG) factors contribute to long-term commercial success. But new research by Corporate Citizenship, in association with S&P Dow Jones Indices, reveals that long-term thinking is still not the norm for many businesses. The internal disconnect between Investor Relations and Corporate Responsibility / Sustainability teams means many companies find it difficult to define, measure and communicate ESG performance. The external disconnect between companies and their investors. 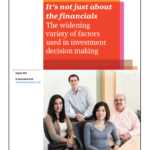 The resulting lack of alignment on the material ESG factors between both parties’ means there is very limited disclosure of these issues in traditional corporate communications to investors. The report identifies a framework for improvement on how companies can bridge these two disconnects through a series of practical actions. It forms part of the launch of The Long Term Value Project, a new initiative by clooking to bridge the gap between IR and CR. We are calling on interested parties to work together to help us identify better ways for companies, and sustainability professionals within them, to find common ground with their investors. 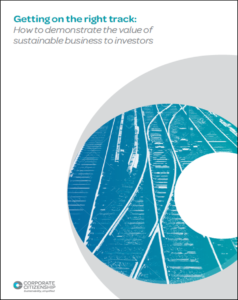 The report entitled ‘Getting on the Right Track: How to Demonstrate the Value of Sustainable Business to Investors’ can be downloaded here.